Ocean Pier I in North Myrtle Beach, South Carolina will be your favorite place to stay on your North Myrtle Beach vacation. It will feel like an oceanfront home away from home during your stay at this North Myrtle Beach resort. At an Ocean Pier I North Myrtle Beach condo rental you will enjoy a swimming pool and a view of the ocean from your very own balcony while you are only a few steps away from having your feet in the ocean waves. Ocean Pier I is located on the oceanfront in North Myrtle Beach, South Carolina. This North Myrtle Beach resort is located at 3701 South Ocean Boulevard and it’s in the Windy Hill section of North Myrtle Beach, South Carolina. Ocean Pier I is only a few blocks from Highway 17 in North Myrtle Beach. From Highway 17 you and your family will find unlimited family fun and adventures and some of the best places to enjoy a delicious Southern meal. Ocean Pier I’s location is ideal for you North Myrtle Beach vacation in South Carolina. Your North Myrtle Beach condo rental provides plenty of parking so that you will be able to park your car and have it close to your North Myrtle Beach condo rental. 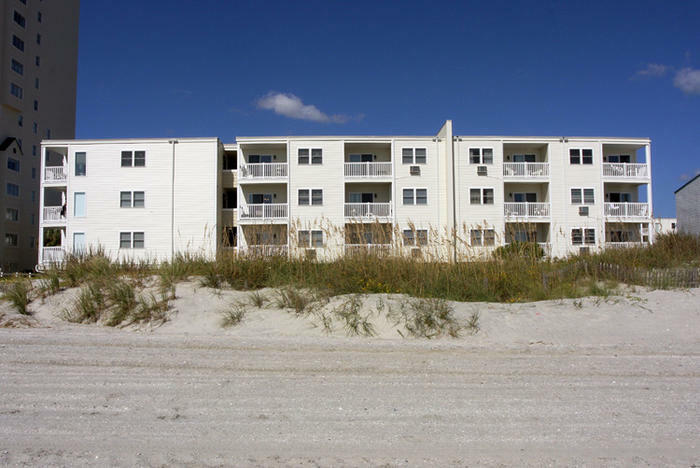 You will be able to access your North Myrtle Beach condo easily. If you stay on the first floor it will only be a few short feet from your car to your North Myrtle Beach condo. Or take the stairs up a few flights to your second or third floor North Myrtle Beach condo rental. If you are looking to stay only steps away from the Atlantic Ocean then, Ocean Pier I in North Myrtle Beach, South Carolina is the place to stay. Just outside the back of the North Myrtle Beach condo rental you will find a short sandy path that leads directly to the Atlantic Ocean and its sandy beach. You will find miles of open sand so lay down your beach towel or walk the shoreline throughout the day. Ocean Pier I provides a deck on which you can take a rest on and enjoy the hot sun and the ocean breeze. At Ocean Pier I in North Myrtle Beach, South Carolina you will find an inviting, outdoor swimming pool. The swimming pool is located on the side of the North Myrtle Beach resort, facing the Atlantic Ocean. At the swimming pool you can lounge or cool off while enjoying the ocean breeze and the South Carolina sun. You will find a lounge chair on the deck of the swimming pool that will call your name. Bring a book to read or watch the kids swim and laugh while perfecting your summer tan. Elliott Beach Rentals is not affiliated with onsite management or the HOA of Ocean Pier I.